CONTENTS: One Polyresin Statue; Contents Come New Individually Boxed With A Precut Styrofoam Insert For Added Shipping Protection. MATERIAL: High Quality Stone Resin That Can Be Placed Indoors Or Outdoors. SIZING: 10" (25.5cm) Tall by 8" (20cm) Wide; Please See Sizing Image For More Details. ABOUT FUNNY GUY MUGS: This Statue Was Designed And Created Exclusively By Funny Guy Mugs. Funny Guy Mugs Is A Trusted Company Founded By Brothers Whose Mission Is To Create High Quality Products That Put A Smile On Your Face. HIGH QUALITY: This Statue Is A Notch Above Your Average Statue! Hand Molded And Painted With Extreme Detail To Make This Kitty Come To Life!! Also Constructed Of High Quality Stone Resin And Outdoor Grade Paint To Withstand Any Harsh Outdoor Conditions. CAT SAFETY: Cat Safety Is A Priority For Us!! We Make Sure Your Kitty Has A Safe Journey To Your Home By Individually Boxing Him/Her With A Pre-Cut Styrofoam Insert For Added Shipping Protection. 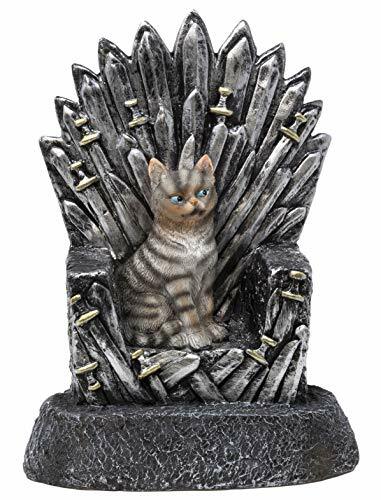 GAME OF CATS: Be Honest, You Know Your Place In The House And Your Cat Knows Their Place... As The One True King That Sits On The Iron Throne!! A UNIQUE GIFT: Imagine The Look On Their Face When They Realize You Didn't Just Buy A Lame Gift But A Gift With Imagination And Character! Perfect Gift For Christmas, Birthdays, Father's Day, Mother's Day, Cat Lovers Or Even As A White Elephant Gift! Fits Perfectly On A Desk, Mantle, Countertop Or Almost Any Space Where It Needs To Be Known Who Is King!! FUNNY GUY MUGS: A Family Owned Company Who Strive To Create Funny Imaginative Products That Last And Put A Smile On Your Face!